The thought of a chilled berry soup for dessert is very appealing, especially now that berry season is just beginning here. 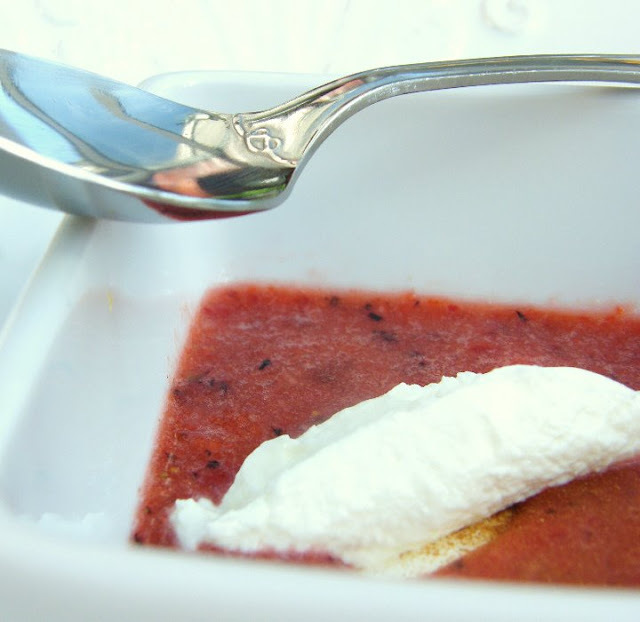 I decided to use my favourite berries in this dessert soup. Bluberries and strawberries. The strawberries are still a little tart, so I added some honey to my soup. This is such a delicious, yet guilt-free dessert, so you can serve it with a light heart and a thankful waistline. Whizz up all the ingredients apart from the honey. Add this towards the end, tasting as you go. How much you need, will very much depend on how sweet your berries are, but it is nice to leave a little tartness to this soup. Serve in bowls with a dollop of thick Greek yoghurt. Drizzle some honey over the yoghurt and sprinkle on a little extra cinnamon. I once had a raspberry soup on vacation and have been meaning to make something like it ever since. Your version looks amazing! Wonderful Holler. I too made a fruit and berry soup. Interestingly, all of our entries so far are soups! I have so many recipes for it, but I have never made fruit soup. This looks divine! What a fun (and delicious) idea! And versatile too. And summery. Mmm delicious. The thick Greek yogurt on top looks like a great addition! Hi Dana,I do hope you try some of them out. Thanks Ashley, The yoghurt was a nice contrast to the soup. I didn't want to add cream, because the soup started off so healthy. What an interesting dessert! I will have to try it. P.S. Did you see that I became a veteran the current Adopt-A-Blogger event (but I mentioned you)! yum yum yum - I want a bowl of this please - and for berry season to come soon! A beautiful warm weather soup! You're taking advantage of the fresh berries in season now. goodness this hits all my favorites. Honey, Greek Yogurt, berries. I will have to try this. This looks very nice, such a refreshing soup. Love berries and yogurt, so this one will be a win win. That would be a perfect dessert...looks delicious. Holler that's the perfect entry for this time of year. LOVE fruit soups - yours looks gorgeous! I've never really been interested in fruit soups, but this looks wonderful! Berries with pear sounds delicious. Hi Johanna, My spoons are all quite scuffed actually. I think I can put that down to the dishwasher, but I do like the design on this spoon, it has a lovely handle. Hi Duo Dishes, I just can't resist when berries start appearing in the shops. I do miss them in the winter. It was when I made it Sylvie, but I look out the window now at the pouring rain, that has lasted 3 days so far and I am more inclined towards a hot soup. The pears are so delicious just now Diann, that I couldn't resist adding one. 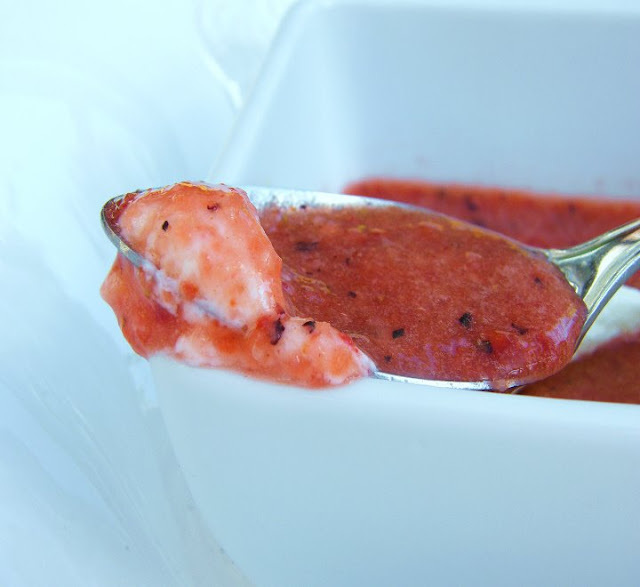 What a lovely & refreshing summer fruit soup! Yummie!